For your participation in the Airborne March, you will receive after you have handed in a correctly completed walking ticket, a reminder in the form of a medal or wing with sequence number. The first medal and then every fifth have the space to apply the following four wings with sequence numbers. 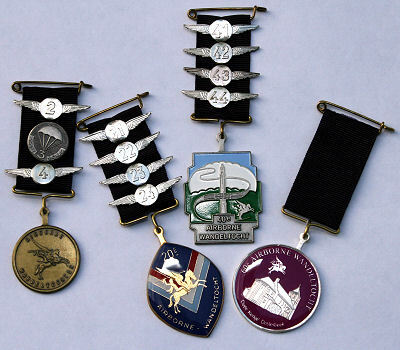 These medals have different Airborne themes and have been designed over the years by several medal designers. Most of the sequence numbers are on a “wing” with a number in the centre. The wing is inspired by the emblem of the British Parachute Regiment, which played a major role in the airborne landings in September 1944. Medals are awarded after 12.00 hours.